When mice share a residence with humans, the results are often problematic and include health risks and infrastructural damage. This is why mice rank high among those animals whose presence in homes is undesirable. Expert animal control services can resolve mice problems on Etobicoke properties. Mice gravitate to human spaces during cold weather. As Etobicoke’s temperatures drop, the rodents will make their way into your home attracted by the warmth and safety it offers as well as the abundance of food it provides. Unfortunately, they are not good houseguests at all as they damage the structure of your building with a buildup of droppings and feces and their chewing and gnawing habits also undermine the structure of your building. They also put you and other inhabitants of the home at risk of diseases such as the hantavirus leptospirosis and salmonella. 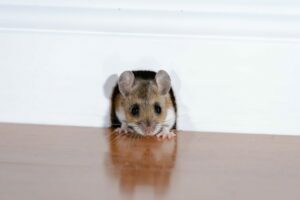 You can tell that mice are sharing your home by the scampering sounds you hear inside the hollows of your walls or in the attic, mostly at night. They also frequent crawl spaces and basements. 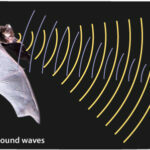 These sounds occur as they scurry about seeking food in your home. 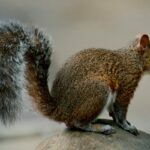 You may even notice dime-sized holes and cracks through which the rodents travel to get from their nesting spots to the food source (usually in your kitchen). Sometimes it is your pets who will offer the biggest clue. You may notice them staring at the walls or scurrying into the attic or basement and then staring intently at what you perceive to be nothing. This usually occurs because they discern (through their keen senses of smell and hearing) that mice are in the building. Once they have made their homes in human residences, mice get comfortable. Do not expect them to ride out the cold weather and then leave when the climate gets warmer. If mice settled in your home during the winter, you can expect their numbers to multiply even more rapidly ( as they are yearlong breeders) as spring rolls around bringing their mating activities into full swing. Up to 6 mice per litter are produced with each gestation, resulting in a home that is overrun by the rodents in a short time span. It is best to prevent mice from entering your space in the first place. Managing waste efficiently can help to reduce the likelihood of mice being attracted to your home. This means you will probably have to get more efficient with your garbage disposal, especially with garbage that contains food scraps. The plus side to this is that you will be deterred not only mice but also other wildlife animals that tend to gravitate to domestic spaces during the winter. Preventing access to the space is the best way to keep mice out. But they are very determined animals and will constantly seek ways to tunnel or gnaw through obstacles to get inside a building. This means you will have to remain vigilant, especially in the winter to ensure that no access points exist to allow mice to crawl inside. A mouse problem is best tackled at the beginning before the rodents multiply and become more difficult to remove. Expert wildlife technicians such the ones at Skedaddle can do thorough home inspections to identify potential access points and then proceed to install exclusion barriers to keep mice and other animals out. This, however, has to be done before the mice get inside. If you have an out of control intrusion situation, Skedaddle offers efficient and safe animal control services that will clear your Etobicoke home of mice.